A couple of weeks ago, I found some heirloom carrots at the St. Lawrence Market. 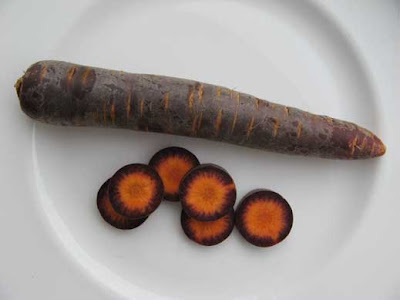 These carrots were purple on the outside, orange on the inside and very sweet. 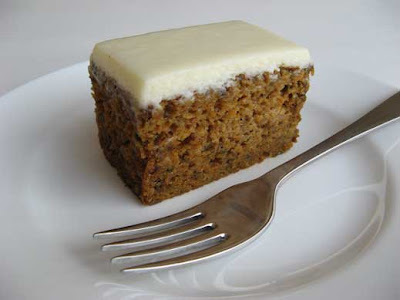 I thought that I would make a carrot cake and knew exactly which recipe I would use - one from Baking Illustrated. I like this recipe because the emphasis is on the carrot. I find that I am often a purist. This cake has no walnuts, raisins, pineapple, coconut or any of the usual pairings. It is simply carrots with a hint of cinnamon, nutmeg and cloves. Served with cream cheese frosting, this cake is a winner. * Note: If you decide to use purple heirloom carrots, as I did, the batter of your carrot cake will be purple. However, once it bakes no one will ever know they are eating purple carrot cake! 1. For the Cake: Adjust an oven rack to the middle position; heat the oven to 350ºF. Spray a 13 by 9 - inch baking pan with nonstick cooking spray. Line the bottom of the pan with parchment paper and spray the parchment. 2. Whisk together the flour, baking powder, baking soda, spices and salt in a medium bowl; set aside. 3. In a food processor fitted with the large shredding disk, shred the carrots (you should have about 3 cups); add the carrots to the bowl with the dry ingredients and set aside. Wipe out the food processor and fit with the metal blade. Process both sugars with the eggs until frothy and throughly combined, about 20 seconds. With the machine running, add the oil through the feed tube in a steady stream. Process until the mixture is light in colour and well emulsified, about 20 seconds longer. Scrape the mixture into a large bowl. Stir in the carrots and the dry ingredients until incorporated and no streaks of flour remain. Pour into the prepared pan and bake until a toothpick or a skewer inserted in the center of the cake comes out clean, 35 to 40 minutes, rotating the pan from front to back halfway through the baking time. Cool the cake to room temperature in the pan or on a wire rack, about 2 hours. 4. For the Frosting: When the cake is cool, process the cream cheese, butter, sour cream, and vanilla in a clean food processor until combined, about 5 seconds, scraping down the work bowl with a rubber spatula as needed. Add the confectioner’s sugar and process until smooth, about 10 seconds. 5. Run a paring knife around the edge of the cake to loosen it from the pan. Invert the cake onto a wire rack, peel off the parchment, then invert it again onto a serving platter. Using an offset spatula, spread the frosting evenly over the surface of the cake. Cut into squares and serve. Posted by Sam at 8:05 a.m.
Oh, I think the purple carrots are cool. Those carrots are so pretty, and I love carrot cake! Why are your photos always so nice?! Je vais revenir vous visiter.